Detail of above: man with broom, far right. Detail of above: man with jug and man with mug. The photograph must have been taken in Summer. The stove would have been very necessary in Winter. 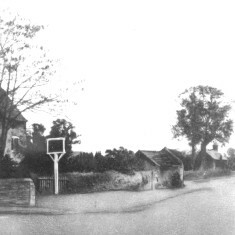 By 1911 this part of Bottesford, now Grantham Road, was called School Road. Number 3, where the Cooper family lived in 1911, was the right-hand half of the semi-detatched cottages with the bay windows, though these were probably a later addition. We are grateful to Mrs.Maureen Hill who has allowed us to copy these fascinating photographs. 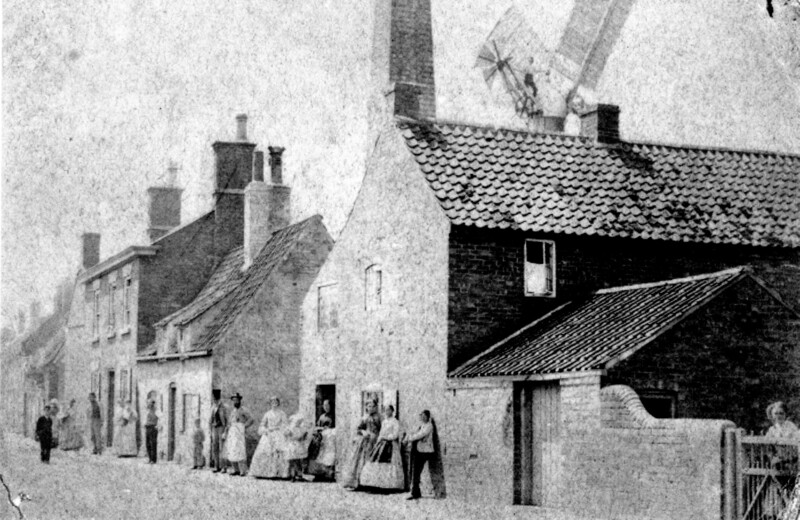 The first picture shows ‘The Lace Room, Bottesford’ , which was part of the Queen Street Mill buildings. Mrs. Hill’s aunt, Nellie Cooper, is the girl sitting just to the right of the window. She was born in 1898, daughter of gardener Robert Cooper (born Bottesford 1868) and Alice (born Bottesford 1873), who married in 1896. 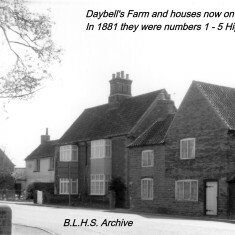 In 1901 they lived at 22, High Street, but by April 1911 they had moved to 3, School Road (now Grantham Road). Nellie looks about thirteen or fourteen, which dates the photograph to around the time of the 1911 census. The census tells us that she had three siblings, William aged 10, Anable, aged 6 and Regenal, aged 4. No employment is listed for her on the census, though the School Leaving Age was 12. By 1901 lace runners have disappeared from the census and there is no reference to lace workers or manufacturers of any kind. 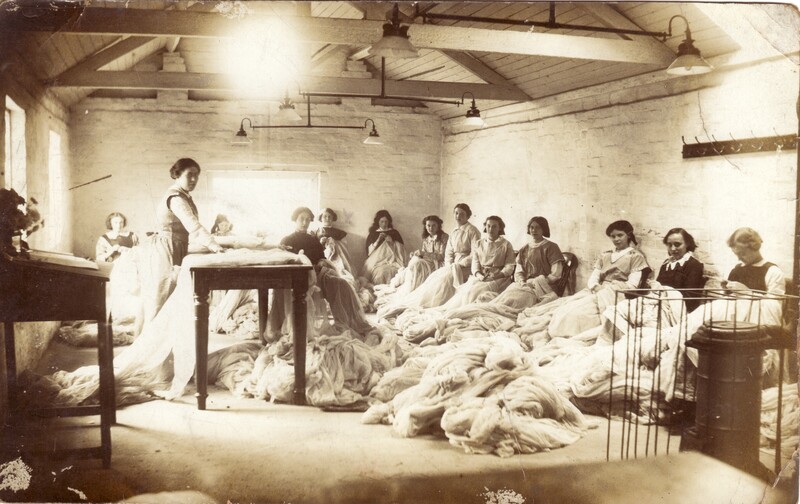 This photograph proves, however, that women in Bottesford were working in part of the lace industry in the period shortly before the First World War. 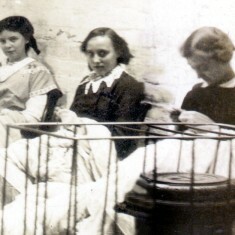 Eleven girls and two older women, are working in an upper room, possibly in Queen Street Mill and Steam Laundry. Most of the girls appear to be aged between about fourteen and eighteen, although one, seated in front of the window, looks a lot younger. Possibly she is the daughter of one of the supervisors. 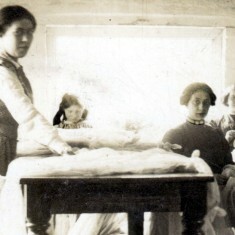 The workers seem to be supervised by two older women, one of whom stands at the table in the centre of the room, perhaps inspecting the lace.To the left is a desk with a ledger, presumably used to record the work completed. 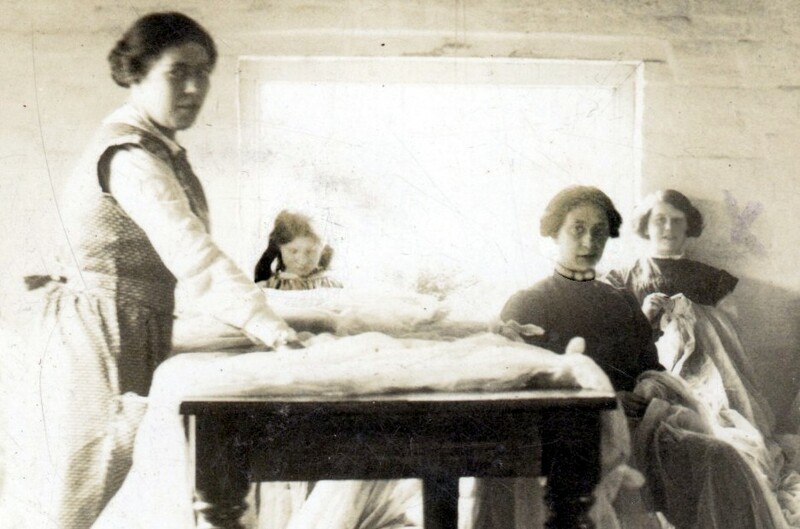 The vase of flowers on the desk, the light clothing of the women and the lack of coats or shawls on the coat hooks all suggest that the photograph was taken in the Summer months, when the light would be stonger.The girls are probably not decorating the lace, but darning flaws, a job that is still done by hand today. 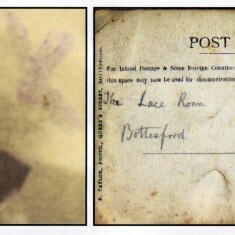 It seems unlikely that lace was manufactured in Bottesford itself. 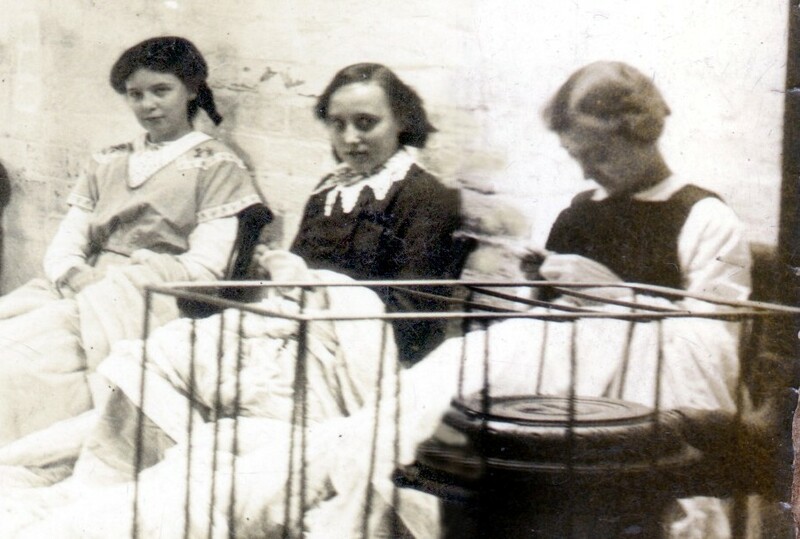 Possibly lace was sent out by train from Nottingham for darning in the villages where wages were low. Perhaps flawed lace was bought from the Nottingham mills by a local entrepreneur who employed young women in the village to repair it. It may have been part of the laundry business going on in the mill at that time. No record of this workshop has come to light so far. The Kelly’s Directory for 1912 makes no reference to it or to the laundry and very little is known about the mill. Please add a comment or leave a message if you can add any information. 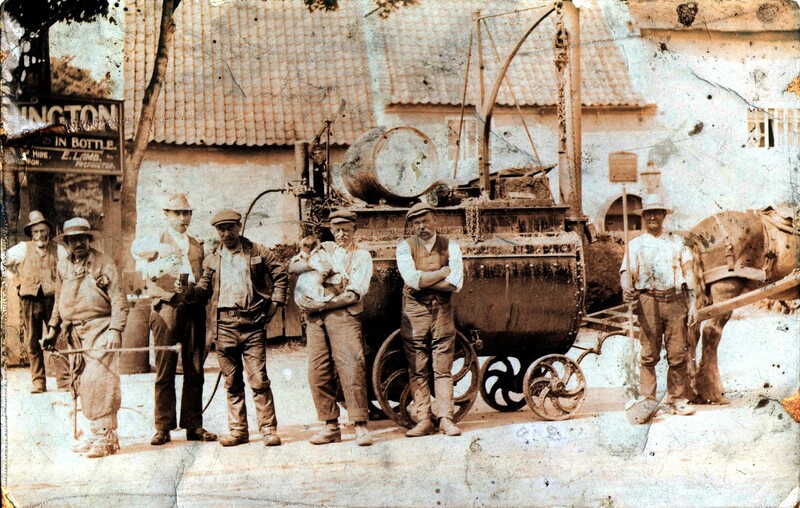 This road gang outside The Red Lion was working with horse-drawn tarring equipment. 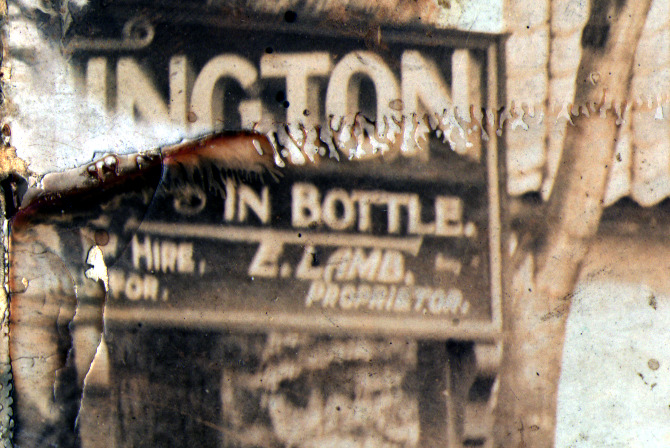 We do not know the date of the picture, but Ernest Lamb, whose name appears as proprietor, is listed in the directories as landlord in 1912, 1916, 1932 and 1936. In the early part of the C20th Rural District Councils usually employed roadmen, or ‘lengthmen’ to maintain the local roads. The fact that the vehicle is horse-drawn suggests an earlier date. Unfortunately we do not know the names of any of the work men. 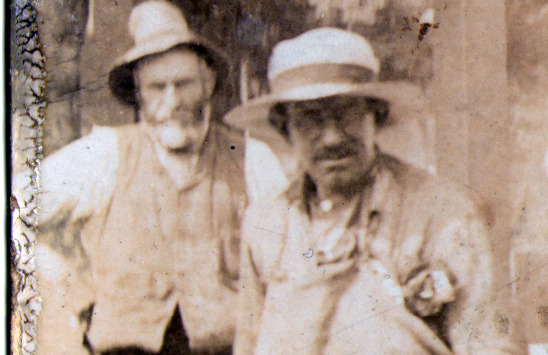 Possibly gardener Robert Cooper also worked as a road mender. 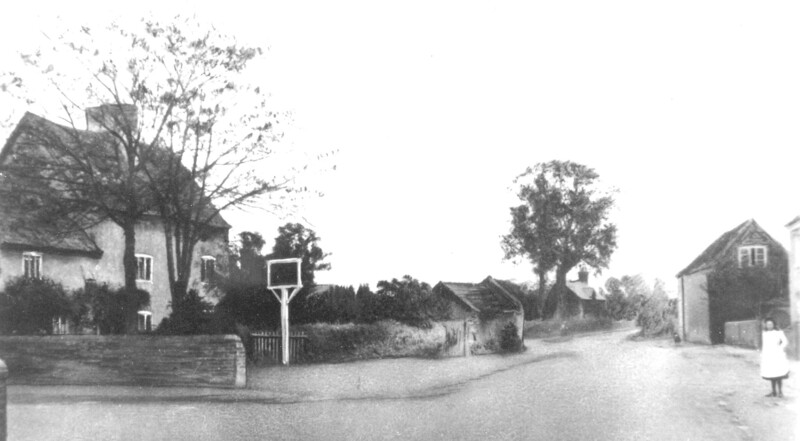 The 1911 census tells us that the Coopers’ near neighbour, at 5 School Road, James Geeson, was a ‘Labourer, Road Repairs’, who worked for Leicestershire County Council. It seems likely that he was one of these men and perhaps Robert Cooper joined him on the team. 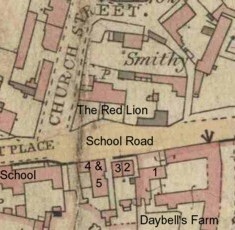 The Red Lion is directly opposite the houses where the Cooper and Geeson families lived. 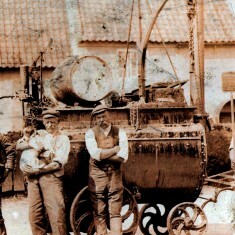 In Derbyshire in 1901, on a road near Denby ironworks, the county surveyor of Nottingham, Edgar Purnell Hooley, saw a barrel of tar which had fallen from a dray and burst open. Someone from the ironworks had covered the sticky black mess with waste slag from nearby furnaces to avoid nuisance. The world’s first tarmacadam surface was created by accident, but Hooley recognised its potential and patented tarmac in 1902. 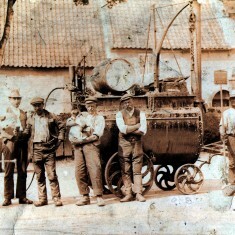 The six men of the road gang have posed in front of their tar-spraying equipment on a hot day. The seventh man, on the left, is probably from The Red Lion. The equipment seems to be a boiler on iron wheels, with a pulley to hoist up the tar barrel and a pump with a spray attached. 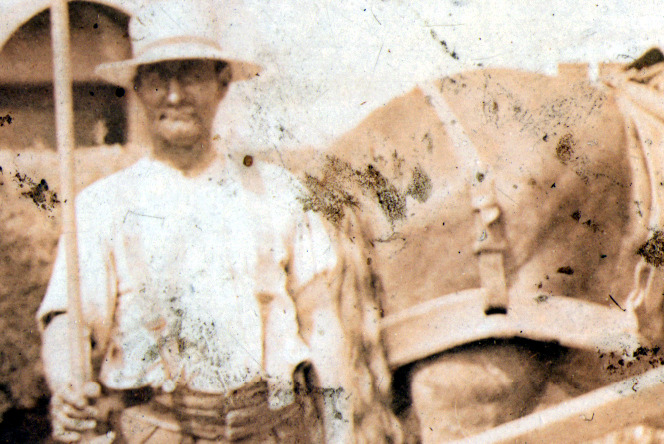 The man by the horse holds a broom. The next man, perhaps the gaffer, stands, arms folded, in front of the machine. 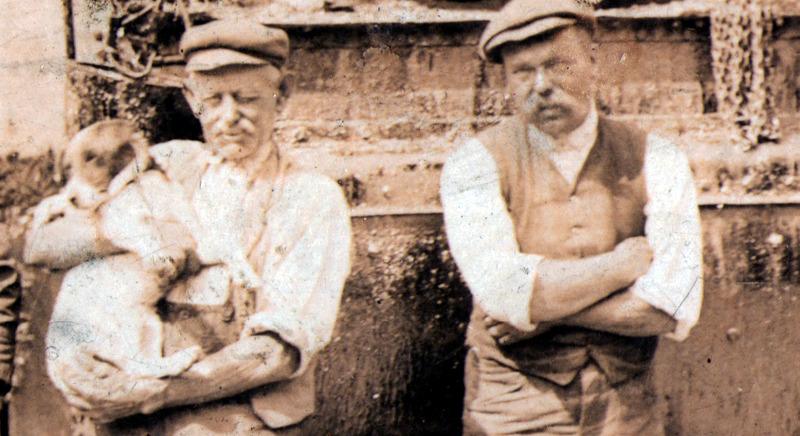 Third from the right is a workman holding his a sleepy-looking terrier in his arms. Next to him a man holds up a mug into which the fifth man pours beer from a jug. The last man, sixth from the right, wears an apron and holds the tar spray. 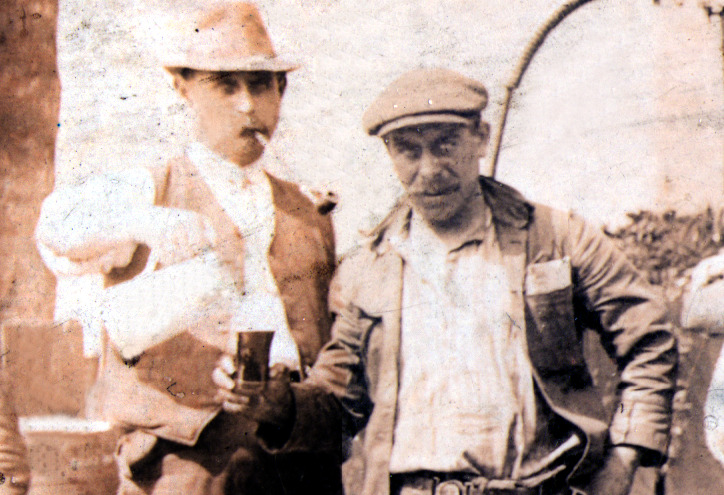 Most of the men are in shirt-sleeves and waistcoats and all wear hats or caps to protect them from the sun. 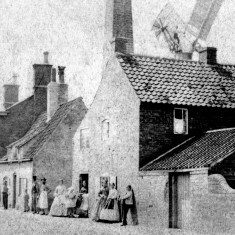 The 1901 census for Bottesford lists no road labourers, but does include six ‘general labourers.’ Kelly’s Directory 1912 includes Ernest Lamb as proprietor of the Red Lion Public House. 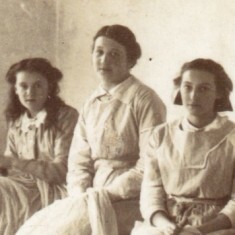 It seems probable that this picture, like the Lace Room picture, dates from around the First World War. 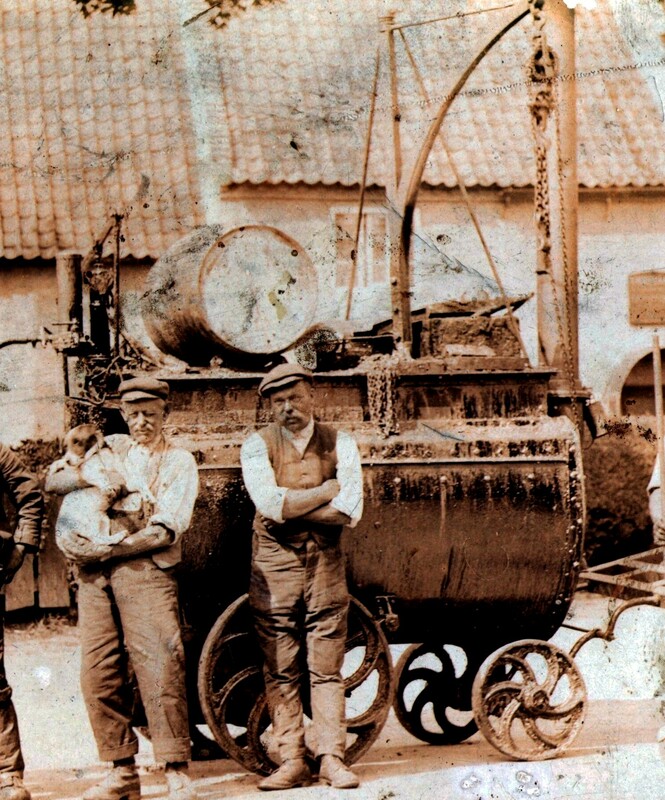 We would like to hear from anyone who can tell us more about the men or the machine in this photograph. This page was added on 26/02/2010. 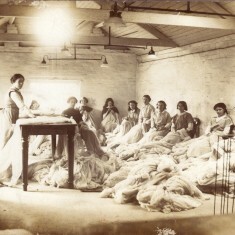 A short memoir by Sydney Pearson Smith entitled ‘How the Great War affected our village (Bottesford)’ provides details of when he went “to see two of his sisters working in a small place off Queen Street making Mosquito Nets for the troops in Mesopotamia.” The Lace room photographs could well be from that period given the volume of material being worked with. 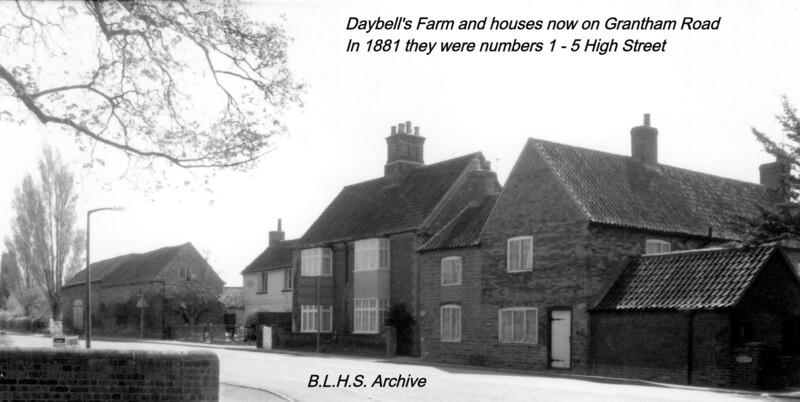 The memoir is available at the Leicestershire Records Office, Wigston (ref DE 1313/13). Thanks for this suggestion. The book is also available from Bottesford Library.